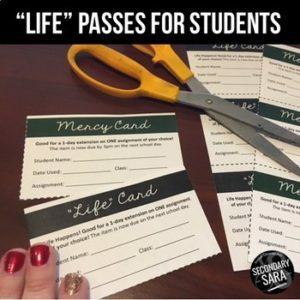 This holiday season (or whenever you want in the year), give students what they really want – some mercy when “life” happens! These cards might be the easiest holiday gift ever (or back-to-school, new quarter/semester, etc.) Use EITHER the ready-to-print PDF version or the editable file to print, cut, and pass out your own “life” cards, which gives the student a one-day extension on an assignment of his or her choice. These are great for the student who had a printer problem, forgot to do an assignment, or just needs a little more time to do a task right! The download comes in black and white AND color, as well as versions that say “Life” and “Mercy”. ← Simple ways to help kids communicate their feelings!